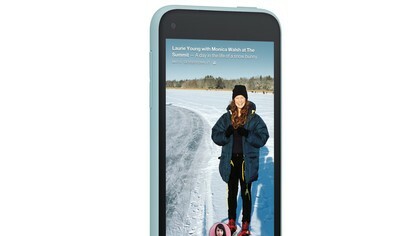 Say hello to the HTC First, the first phone to highlight Facebook Home, an Android overlay newly introduced by the social network. This is not a Facebook phone, nor is it not a Facebook phone. Confusing? 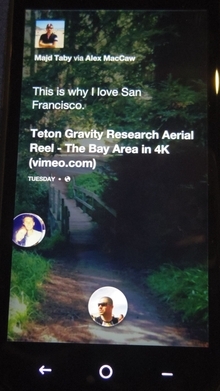 Yes, but what we mean is that this is a phone built by HTC with Facebook DNA. You can turn Home off, but that sort of defeats the First’s purpose. Immediately upon turning on the First (after the obligatory Android opening), users are greeted with a log in screen to sync their Facebook accounts with the Home experience. What Home, and by extension, the First, really boils down to are photos and content. A constant stream of images and captions merry-go-round through the home screen. The lockscreen is never the same – whenever it’s turned on, a picture of your buddy skydiving, an underwater sea turtle, or the picnic you weren’t invited to occupies the space. A little bubble of your profile image lives on the screen, a kind of mini-guide that when you press on it is ready to take you to app launcher (on the top), Messenger (on the left), and whatever app you used last (to the right). Status updates are shown in a larger text to differentiate from photo captions. There’s some Facebook mojo used to show the most interesting/Liked/commented-on images, with an eye to make it so content you would be compelled to interact with what’s shown. As an actual piece of hardware, the First itself is fine enough, though definitely not a sleek, plasticized high-end handset. Made of a rubberized material, the body is has an almost rugged feel. 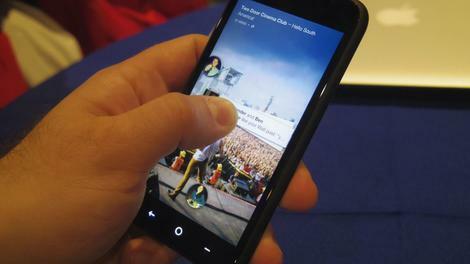 What is nice is that the 4.3-inch screen feels expansive, offering a canvas for users’ photos to breathe. Resolution-wise we’re looking at 1280 x 720. 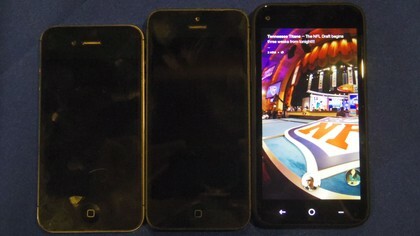 At 125.6mm x 64.93mm x 8.96mm, it edges out the iPhone 5 in size. 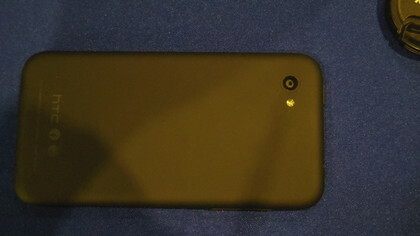 The actual edges of the device are softly rounded, and it weighs an appreciable 4.37 ounces. Compared to the iPhone 5, the screen pops in a really attractive way. We almost felt like moths being drawn to a lamp – it was hard to ignore the flow of pretty pictures. All in all, the body feels like a carrier for what Facebook and HTC really want you to focus on – the Facebook Home experience. Users can escape Home if they desire in Settings, though their only options are to lower the image resolution or turn Home off completely, a Facebook rep explained. Turning Facebook Home off will essentially bring the First back to a normal Android 4.1 experience. There is a Home icon that, if tapped, gives users the option to reactive the overlay if they like. There’s a Snapdragon 400 processor with 1.4GHz dual-core CPU inside, and we’re told that battery drain of the 2000mAh juicer isn’t too different than a comparable handset, though there is extra drain caused by the Home’s always active capacities. Camera functionality is an two-headed beast. Users can either snap photos through the Facebook Camera function (accessible within the app launcher in a bar along the top) or through the phone’s standalone camera app. The 5MP snapper is fine, though perhaps consumers would expect something a little stronger to pick up the pics they’re about to post to Facebook. A few things stood out to us as peculiar. Facebook hasn’t forked Android, it wants you to know, but there are definitely some aspects that are, shall we say, unique to the Facebook Home and First experience. Something we found quite odd was that your profile pic button, floating above the bottom of the screen, doesn’t actually take you to your profile when you click it. An FB rep said that you have to take the normal route to get to your page, i.e. through the Facebook app, and that’s "probably something we should think about" in future iterations. We understand that pressing on it serves as a gateway to other functions, and as a rep told us puts you at the center of the phone experience, but intuitively one would think your profile picture would take you to your profile. Another semi-off putting element is that you have to go to the app launcher to access your phone. The focus truly is on Facebook and communicating with your social network through features like Chat Heads, essentially bubble-headed icons of friends that wobble onto your screen when they message you and allow you to keep your conversations with you wherever you are on your phone. Even if you launch an app, your Chat Heads will stay present wherever you like on your screen. A tap on the topmost one will let you open all conversations, while holding a bubble and swiping it down pops them off your screen. You could keep conversations going for as long or as little as you like, and the icons will appear as soon as you receive a new message. Chat Heads work with both messages and SMS messages, so there’s continuity with your text-based communication experience. There also doesn’t seem to be a way to slow the flow of pictures, unless you comment or like them (a double click will let you comment while hitting the comment icon along the bottom lets you leave a post). While it’s not necessarily a bad thing, it was jarring to look at what essentially feels like a Facebook wall paper only to have it suddenly switch. After some time this would likely be less bothersome, but initially it was a weird feeling to see something you expect to stay static move. 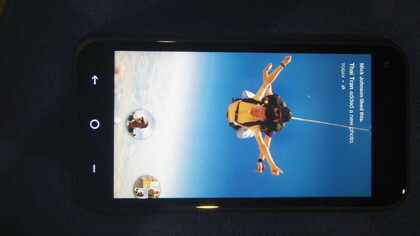 This is an HTC phone built in conjunction with Facebook to make you use Facebook on an almost constant basis. If that’s attractive to you, then you’ll like the First. We hesitate to say "love" because the hardware isn’t overly compelling, though it’s hard to argue with a Jelly Bean handset that costs $99.99. There are some odd elements, as noted above, that one must accept as part of the Facebook Home overlay experience. Thankfully, there’s choice as to how you use Home, though your options of what stays and what goes is extremely limited. If you want to leave your social network behind while you’re on vacation, at least you have that option. Of course, the flip side is you can stay pretty much in constant contact while your out of your normal surroundings as well. We found navigating around the device took some getting used to as it didn’t mesh with the usual Android UI, but since the icons are built on a tactile, spring-inspired principle of movement, eventually we got gestures like shooting our profile picture bubble up to access our apps. Is this a successful first try at baking Facebook into an Android device? We give a reserved yes, though there are definite areas that need improvement. 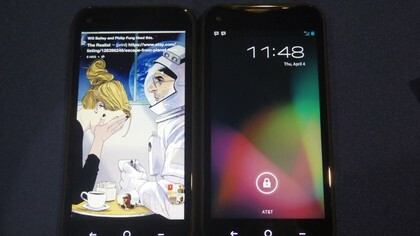 Maybe by the time Facebook and HTC gets to the Second (or whatever it’s called), Facebook will have figured Home out.